The Prague New Year's Eve Planner will be published exclusively on this website in mid-October 2019. Several thousand people book through the planner every year, making it the city's main guide to the festivities on 31st December 2019. From romantic restaurants to river cruises, and parties in bars and clubs, the Prague New Year's Eve Planner is your guide to the entertainment. Some venues are exclusive to Prague Experience so are not available to book anywhere else. Prague Hotels: We have rooms available at many good city centre hotels. Prague City Break: An easy way to organise your Prague trip is to book a Prague Package. Includes a hotel, airport transfers, sightseeing and entertainment. 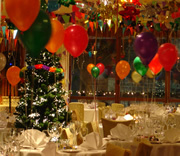 Celebrate New Year's Eve in Prague in style!